Great news! Coach Dabbs & Toody Byrd will be our guests at the reunion! Scott Sparks will do the "Hat Dance" there also! October 13, 6:30 PM, County Line On-the-Hill. Registration opens soon via this website. Welcome to the Westlake High School Class Of 1972 web site. Please take a moment to update your profile on this website. There is no cost to you in using this website. 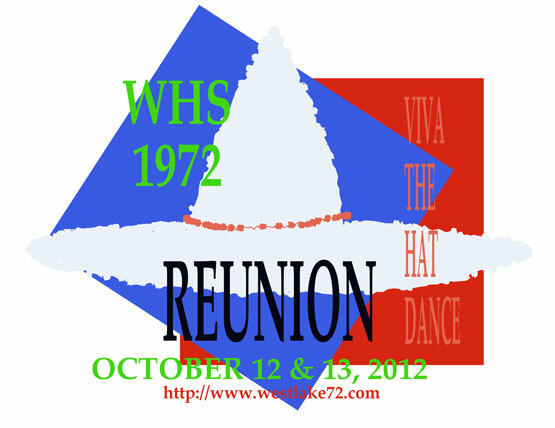 Our 40th Reunion is set for October 12 and 13, 2012. REGISTER AND PAY NOW THROUGH THIS WEBSITE for the Saturday night dinner party (See tab titled "2012 Reunion"). Registration must be completed and paid for by October 3, 2012, and no registrations or payments will be accepted at the door. Donny Gray and Callie Goodrich are serving as Reunion Co-Chairs. If you have questions, contact Donny or Callie. Questions about the reunion or the website can be directed to Donny at 512-496-3583 or donaldkgray@gmail.com. The list of classmate provided in this website is based on the WHS 1972 Yearbook. WHS tells us that they do not maintain a list of graduates. If we'd known that years ago we might have simply quit school and told folks that we graduated! Ha! Bottom line is to contact either Callie or Donny if you find that the list of classmates is not accurate. We were Westlake’s first graduating class. Hooray! Laura Burt was our Valedictorian and Mary Pesl was our Salutatorian. Scott Sparks was the class’s highest ranking male student. David Wooldridge and Jane McPhaul were selected as Mr. & Miss Westlake by the student body. Scott Sparks was the Jalisco Hat dancer at pep-rallies, a WHS tradition that continues to this day. Julie Donnelly progressed to Tennis Regionals in '72; and was the very first girl to earn an athletic letter (Sweater), at WHS. How about that! UIL contestants did well during the 71/72 school year. Seven first places were earned. The cast of the one act play, “The Bald Soprano”, won first place. Our classmates in this play included Glynn Bloomquist as Co-Director, Jane McPhaul and Scott Sparks were named Best Actor and Actress, Jimmy Day was a part of the All-Star Cast and Jerry Hughes won Honorable Mention. Glynn Bloomquist represented Westlake at Boy’s State. Lynn Westbrook won first place in 71/72 UIL spelling, Jerry Hughes won first place in 71/72 UIL News & Headline Writing. Mary Bartholomew won first place in 71/72 UIL Informative Speaking. The 71/72 All-District football team included Scott Ingraham, Tim Skaggs, Glynn Bloomquist, Ben Looney, Jimmy Day, Bob Mayo, Steve Thompson, Thad Joyner and Roy Collins. Glynn Bloomquist, Jimmy Day, and Bob Mayo won AA All-Centex honors and Bob Mayo was selected for Super-Centex. The 71/72 varsity football team finished with a 9-1 season and was ranked as high as 8 in the state AP poll. The 71/72 cheerleaders included classmates Jane McPhaul, Linda Bolles, Daredeth Scritchfield, and Nancy Landers. Our basketball and tennis teams won first place in 71/72 District competition. District basketball players in 71/72 included David Wooldridge and Scott Ingraham. Paul Pearcy won a spot on the 71/72 Regional tennis team. Our Cross Country team was ranked third in the state and included classmate Jerry Hughes. Kent Polk and Chuck Ballard. Eric Carlson earned a first-place in State swimming. In 71/72 District track, Lann Bookout’s winning high jump was 6’. Jerry Hughes won a second in the mile run event at the 71/72 District track meet with a time of 4.31. The 71/72 All-District baseball team included Scott Ingraham as catcher. Mary Bartholomew earned a place on the District volleyball team. Daredeth Scritchfield was our Homecoming Queen in 1971. Member of her court from our class included Mary Pesl and Betsy Blocker. Jane McPhaul was our 71/72 Football Sweetheart. Terri Mitchell and Patty Peyton were named as Miss High Kicks on the Hyline team. Linda Bolles served on the Track Court. 71/72 District Band honors went to classmates Paul Pearcy, Chuck Ballard, Brian Page. Regional chairs went to classmates Chuck Ballard and Paul Pearcy. Area Band and All-State Band honors went to Paul Pearcy. Lynn Ledbetter won district, regional and state 71/72 UIL honors in orchestra . The 71/72 National Honor Society included classmates Scott Sparks (president), Laura Burt (VP), Mary Pesl (Secretary), and Lynn Ledbetter (Treasurer). The 71/72 WHS drama team, the Royal Globians, included classmates Scott Sparks (President), Jane McPhaul (VP), Mary Bartholomew (Secretary). The 71/72 Student Council included classmates Tani Adams (president), Paul Pearcy (VP), Laura Burt (Secretary), Danny Franklin (Sergeant-at-Arms), Bill Bales (Treasurer) and Scott Sparks (Reporter-Historian). Chuck Ballard served as the Band Captain our senior year. Hyline officers from our class in the 71/72 year include Mary Pesl (Captain) and Lieutenants Kathy Bell, Gail Hess, Melinda Meyer, and Mary Gates. The Yearbook staff included classmates Mary Pesl (editor), David Wooldridge, Paul Pearcy, Greg Geisler, Glynn Bloomquist, Bill Bales, Daredeth Scritchfield, Melinda Meyer, and Donny Gray. Jerry Hughes was the Roadrunner Express newsletter editor.